Nothing beats a bowl of hot and homemade chili with beans. It’s comfort and casual — the perfect meal to make you feel at ease and welcomed. Unfortunately, at times, the characteristic of being homemade may be out of reach. This can be due to unavailability of resources, lack of time or simply the inability to whip it up. This is where the blessing of canned chili comes in. Now some of you may beg to disagree considering that canned is not necessarily a healthy choice. Nothing can still beat the freshness and quality of a chili that is made right at the heart of your home. However, this is why I came up with this list. 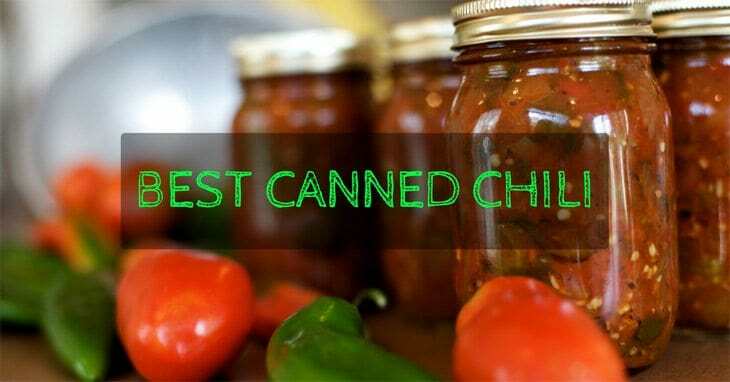 Rounded up here are the five best canned chili that comes with the highest quality. Read away plus find out what makes a canned chili the best and all the additional factors you have to consider. The first entry is certainly perfect for those looking for vegetarian options. The Wolf Brand Chili boasts of a content of 50% veggies composed of tomato chunks, of course. And then there are some onions plus green bell peppers. Combined with the content of veggies comes the Holy Trinity — or the three most essential ingredients of a chili — which are the beef, the beans and the tomato. However, it should be noted that the beef of Wolf Brand Chili is cubed. You may want to consider other options if you are more inclined to choose ground meat. In addition, it also does not use kidney beans which may be the preference of some of you. 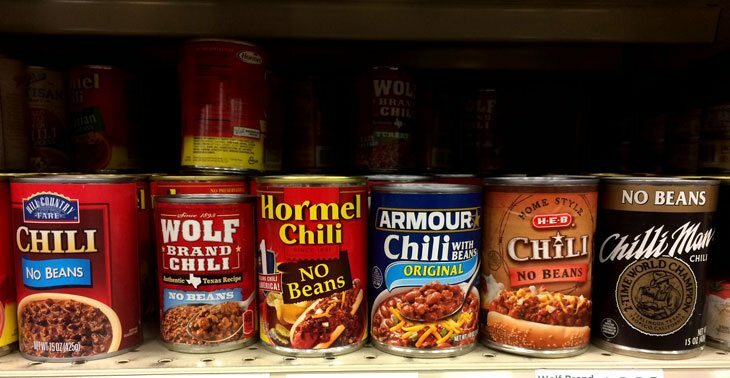 Instead, Wolf Brand Chili uses the normal beans. As for its sodium content, it comes with a relatively high amount of 880 mg which is obviously not advisable for those going through kidney problems. If you are the type of person who will most probably use chili to whip up pasta, then the Skyline Original Chili is the right fit for you. It comes with a layer of flavoring that really complements well the taste of hard cheese you often use on pasta such as Gouda. Despite possessing the same consistency as pasta sauce, the Skyline Original Chili still does not lose its versatility. With Skyline Original, you are still able to get a chili that you can use as a dip for your nachos. It has a unique combination of the usual veggies, the meat hplus some spices which include paprika among all others. One thing I notice about this though is that it is a little high on the content of sodium. Much like the previous one, this might not be a good option for those with kidney or gallstone problems. Craving for that yummy chunkiness of tomatoes? Looking forward to that thick texture of chili? Then the Chili by Campbell brought to you with Bean Roadhouse is a good match for what you need. It is comprised of the two most essential meats which are pork and beef. This created a meaty feeling when added to the chunkiness of the tomatoes. What makes the flavor more complex is the added ingredients which are comprised of kidney beans and corn among some more others. It, however, essential to take note thats its level of spiciness is on the mid level. This can be both a bad or a good thing depending on your tolerance for spiciness. Next up on the list is another chili that comes with no beans. If you are kind of against beans in chili then this can be a good choice for you. It is very easy to whip up and the most ideal for those who are usually on the go and rushing. It has a combo of beef, jalapeno and onions among all others which include tomato concentrate. One thing that saddens me about this, however, is the ratio of the vegetables to meat. With the ratio, the meat amount is relatively less than the vegetables which does not balance out the flavor. Despite this, you still get a decent source of protein from this. It contains 16 grams of decent protein for every serving which is not bad at all. Last but most definitely not the least, we have the Chili Con Carne by Nalley Original. Unlike the previous one, this entry comes with the good ol’ beans which are perfect if that’s what you are after. I consider this as one of the healthiest options with a relatively great amount of fiber. This is countered by a low amount of fats. In fact, its benefit goes beyond the health aspect. It is also one of the most authentic tasting one with a resemblance to homemade chili. In addition, for some additional information and advice, I suggest you add some tabasco in it. It really adds a more complex layer to the flavor of this canned chili. 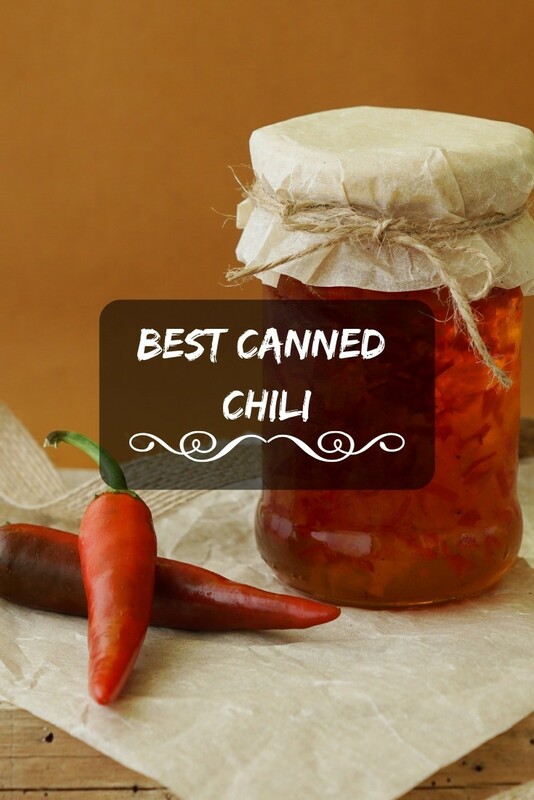 Best canned chilI – top picks and a complete buying guide for you! A tip for #cooks all around. A canned chili is only as good as the blend and combo of the ingredients that it contains. First and foremost, what you should always keep in mind are the following: meat, beans and tomato — The Holy Trinity of Chili. More than just the right combo, the blend should also be of good quality. Its individual aspect must still be good. First and foremost, let us talk about the sauce which is supposed to be made out of tomatoes. As such, the detail of the sauce has to be thick and gooey. 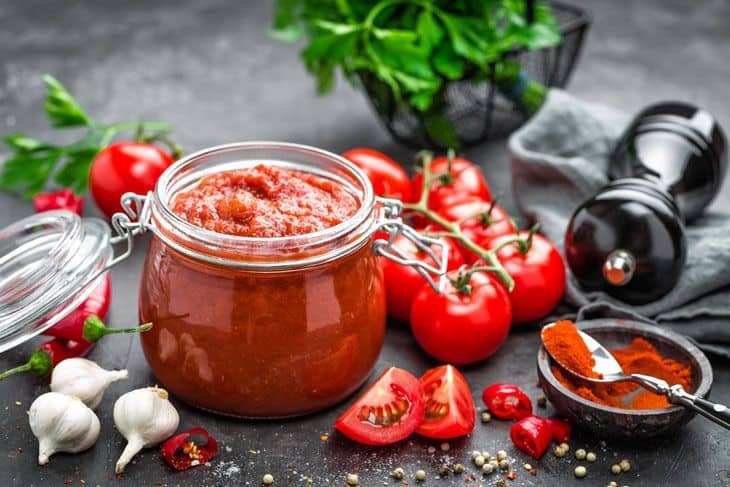 This means that while the product is canned, the sauce must be made from authentic and real tomatoes. This is ultimately what gives the sauce it’s thick characteristic. Additionally, there is also the meat which should be equipped with just the right level of tenderness. It should be able to complement the taste of the sauce without clashing with one another. Lastly, let’s talk about the beans. The beans should be soft enough but not lumpy. It should have thickness as well that will give the chili more layers. Next, let’s about the meat. Primarily, there are two types of meat which are used to make canned chili or even homemade chili. These are either ground meat or cubed meat. However, it is important to take note that ground meat is usually the way to go. Primarily, this is because ground beef is usually a mix of the right combo of different variations of meat. However, be it ground or cubed meat, always keep in mind that the meat must be savory enough. It must not have that metallic and bland taste. The texture has to be soft and should feel tender enough. Sometimes, what could make or break any chili is the level of spiciness or spice that it comes with. 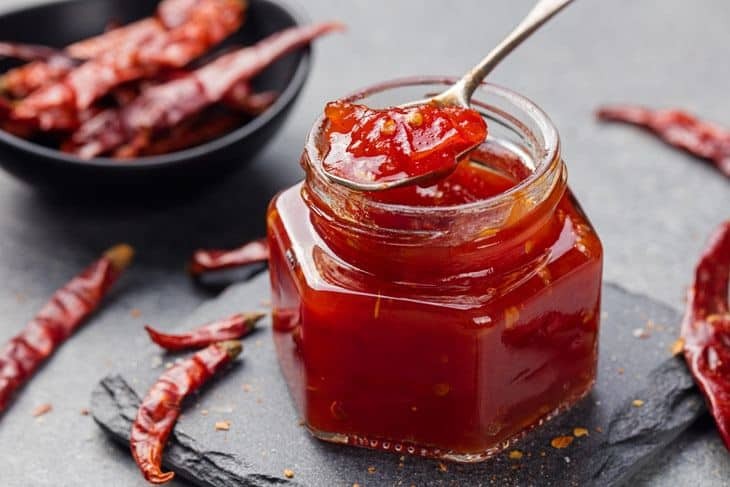 We all have different tolerance for levels of spiciness, however, there is always that general rule of thumb we follow to ensure goodness of chili. And that is that the level of spiciness should just be enough to generate that tinge of tanginess. This should come with the bits of the hot and chili peppers. This spice should be layered with the flavor of fresh tomatoes added to an appt taste of smokiness. When all else fails, it is best to go for canned chili that has a level of mild spiciness. Ah, beans. Almost no canned chili in the market exists without beans. However, this should certainly not discourage you from getting canned chilis free from beans if that is what your heart absolutely desires. However, having established the fact that almost chilis in the marker come with beans, it is safe to say that one important thing you have to check before buying is the presence of beans. If you do decide that you want beans, remember to always stick to the rule of thumb. Beans must never be overcooked and must therefore not be lumpy. In the event that you want to prolong the shelf life of your canned chili, it is probably best and advisable for you place the contents to a freezer bag as storage. Place them inside the freezer. This should extend its life for about six months. When thawing, there are two primary rules to keep in mind. First, if you plan to consume it right away, then you may opt to thaw it with the use of microwave or by submerging it under water. If, however, you want it to last for a few days then I suggest you thaw it with the use of refrigerator. Always check the smell and appearance of the canned chili before consuming. These are two factors that will greatly determine if the product has already gone spoilt. If the odor has turned bad, the chances are it already has. You may also check if the canned chili is already inflicted with elements such as molds. In the event that you have kidney problems, it is best to look for canned chili options are low in content of sodium. Sodium is an element that plays a big part in its flavor. However, the key will always be moderation. This will regulate your kidney problems, if any. The consistency of the canned chili must be thick but there has to be a balance. It should not be thin and runny to the point of imitating the consistency of a stew. Instead, it should be rich. In addition, it also should not be too thick that all it is composed of are solid chunks of tomato. The best canned chili is none other than Campbell's Chunky Chili, with Bean Roadhouse. The Chunky Chili by Campbell as the name suggest has one of the chunkiest fillings. Its texture is flavorful and feels heavenly in the mouth due to its chunkiness and thickness. The flavor is further layered by elements and ingredients which include kidney beans. It also has a good combo of meat that ties up everything which are beef and pork. Lastly, it has that mid level of spiciness that is just right. Are You Curious If Your Watermelon Has Gone Bad? I have tried all of your chili’s you named. Vietti Chili with beans beats them all. That’s just me. Thank you. Rayford Latham. 1627 Delwood Circle, Scottsboro, al. 35769.